I seem to have this figured out. My Classic with the high output 500T in it has been my main LP since I bought it new. It has been great with lots of output and crunch. I bought a 2006 Standard that came with Burstbuckers and I hated it, Changed them to 498Ts and now love it. I also have a 2005 ES-335 with 57 Classics, that guitar screams. I had tried a friends 2005 R8 and wasn't impressed, no punch. 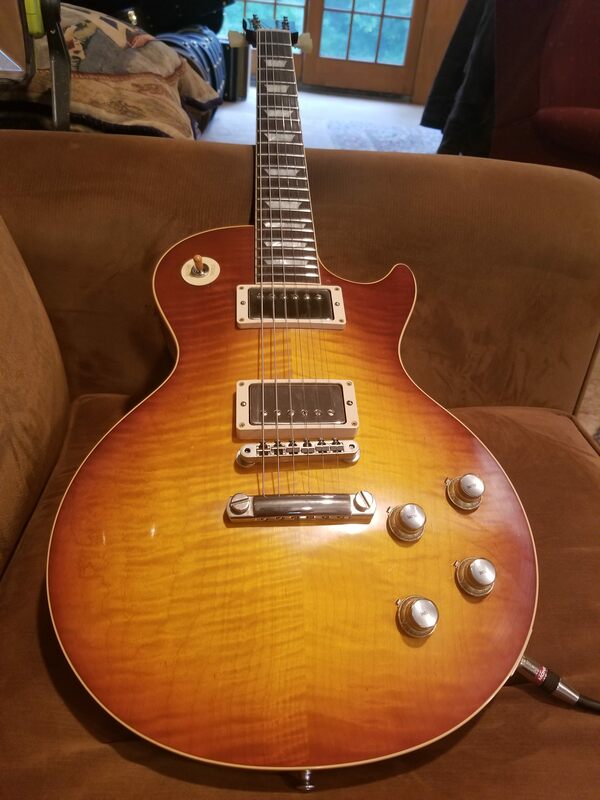 Fast forward to last fall, I paid a lot of money for the 2018 Historic '60 and love it, it has punch, crunch and it screams, it does everything and the detail is exceptional, one thing my other 2 LPs don't have as much. My 335 on the other hand is very similar to the R0. I think I know why, the R0 is very acoustically loud, like my 335. My other 2 LPs are not, being denser and stiffer. My theory is that if a guitar is resonant and lively unplugged, it can get away with low output pickups and still be a rocking guitar. A denser stiffer guitar will sound weak with low output pickups and will need higher output pickups to really have some punch. I think this is why as guitars became more denser high output pickups naturally followed suit. I think the recent Historics are as close to the originals as they have ever been and I am glad I waited and finally got one, it is like magic with Plexi heads and 4x12 cabs with Greenbacks in stereo. Yes guitars that ring out nice and clear unplugged naturally is a great indicator of how good it will sound through an amp. I used to always think that I needed high output pick ups. However I recently got 2007 gibson sg 61 RI that has a set of Seth Lover Seymour Duncan pickups installed in it. I must say at first I was not a big fan of the open coil design. The guy I got it from said he took them out of a reissue les paul and put it in this SG then sold the les paul. Now I must say I know that Duncan makes some very good pick ups. I have had a few super strats with them in it but never owned a set of low out put pick ups. I must say that this SG sounds like heaven. It brings out the guitars natural "WOOD" tone. It is I believe the best sounding guitar I now own. When I play it through my fender 65 reverb on clean the tone is so nice and it really does ring out well. When I step on my stomp boxes to add some gain, you can hear the notes all ring out nice and well with a great balance through the spectrum. There is not too much bass or too much treble. It sounds fantastic and the notes soar with glory instead of sounding so shrill with higher output pick ups. I now have a new to me les paul custom with BB1 and BB2 pick ups. The les paul custom is chambered itself and this pick up combination on this particular les paul custom is very pronounced through my amp. It seems to have a higher output than the 57 classics in a traditional les paul that I just parted with. I always thought that a more solid bodied les paul would sound better than one that had been chambered. Well I found out myself that that is not the case at all. I think the chamber in the custom adds volume acoustically to this les paul custom. I can only speak for this one because it is the only one I have ever played. I thought that the 57 classic pick ups would have more punch than the burstbucker 1 and 2 pick ups. They may actually but since the les paul custom has a chambered body, I think that is why it actually sounded louder than the traditional les paul did plugged in to my amp. So that being said, I think I may prefer lower output pick ups compared to higher output pickups because I believe the lower output pick ups make a guitar sound more natural plugged in or glassy like instead of being so shrill. And I can always crank up the volume on my gain settings if I need more volume. Gary Moore can really make those guitars sing. Here are some more of my ideas. The louder a guitar is acoustically the less inherent sustain it will have. The sound you readilly hear is energy being taken away from the string. Therefore losing energy it will lose sustain. Think of a steel guitar. Low volume, long sustain. On the other hand a loud guitar acoustically will have a short sustain until an amp is used at a good volume. The same property that made the guitar loud in the first place (letting sound out) will induce feedback and sustain from the amp (letting sound in).